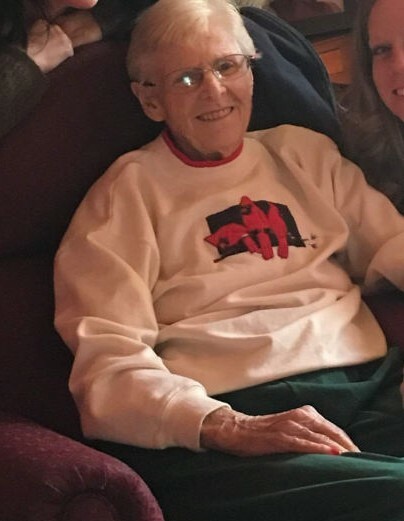 Elaine (Yorgey) Vernacchio passed away on Tuesday, January 29, 2019. She was 85. Mrs. Vernacchio of Audubon formally of Norristown was employed as a machinist at the former Plymouth Golf Ball Company and in packaging at Confab Inc.
Elaine enjoyed sewing, reading, watching old time TV shows, listening to Elvis music and spending time with family - especially her grandchildren & great-grandchildren. She was born in Norristown on September 8, 1933 and was the daughter of Russell and Esther (Souder) Yorgey. She was predeceased by her husband Charles, two daughters Debby Andrews-Fields and Donna Haines and two brothers Russell "Skip" Yorgey and Jerry "Sonny" Yorgey. She is survived by her son Charles (Beverly) Vernacchio, her daughter Diane (John) Skrzat, one brother Merrill (Barbara) Yorgey, two sisters-in-law Barbara Yorgey and Doris Brady, two son-in-law Tim Haines and Gary Fields, 12 grandchildren and a number of great-grandchildren and loving friend Kathleen Tolmie. She was a lifelong member of the Norristown Maenner Chor Club. Family will receive relatives and friends Saturday, February 2 from 12 noon to 1:15 for family condolences at the Volpe Funeral Home 707 W. Germantown Pike at Whitehall Road East Norriton. Funeral service to follow at 1:15. Family requests, in lieu of flowers, memorial contributions can be made to the St. Jude Children's Research Hospital.